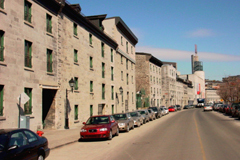 Located in a 200-year-old building in the heart of old Montreal, TFX Animation has been at the forefront of computer-generated character animation since the late 1980s. The mission of TFX Animation is to create the most breathtaking computer-generated characters possible. TFX characters have brought imagination and humor to many national and international commercials. And now, TFX steps to the forefront again with the release of its flagship film Adventures In Animation 3D, an astonishing 3D giant-screen event. At the helm of this inventive organization is animation pioneer Pierre Lachapelle. Under Lachapelle's guidance, breakthroughs are the hallmark of TFX. TFX created a series of firsts: CGI (computer-generated imagery) crowd, CGI hair and CGI animated clothing. Other breakthroughs include LIFEsource which offers complete capture of the body, face and hand movements of as many as four performers simultaneously. TFX's red-hot, facial motion-capture technique is patented. Meanwhile, TFX's sister company, Digits 'n Art, developed the pioneering 3D Paint software, Flesh. Plus, TFX Animation offers a talented support team of technicians, artists, producers and software development experts to meet the needs of the most complex project. Or the simplest. For example, several years (and one giant fire) later, through innovation and imagination, Adventures in Animation 3D finally hits the “big” (heck, giant) screen. It is a testament to the passion TFX Animation has to make highly original, detailed and life-like characters a reality. TFX Animation is indeed a driving force in character animation. In fact, once you see what they have accomplished with Adventures In Animation 3D, you'll believe, as they do, that there are no obstacles to creativity and imagination that can't be overcome with dedication, hard work and, most of all, passion. day's work, nothing was left.